Tropezia Palace - Read this review before registering! The online casino Tropezia Palace was established in the year 2010. The casino quickly managed to get a reputation in the competitive market of Internet gambling, thanks to the impressive game selection, the promotions with attractive terms and their professionalism. Below you can find a short overview of what awaits you in this prestigious virtual casino. Let us start with an important factor: the general design of Tropezia Palace. When it was launched online in 2010, the graphics on the website where in an art deco style inspired by the Roaring Twenties. At this time it made sense, since the competition did not really care about the aesthetics of their pages. However, this attitude changed, and when the online casino modernised its design in 2013, the result was rather simple and almost bland. This is not really a bad taste, but the design is just not very exciting. The 1920s atmosphere that gave the site a certain character has virtually disappeared. Having said that, the menus are still nice and the general architecture and navigation have been carefully designed and are easy to navigate. Fortunately, a new graphic update in 2017 has just modernised the whole with chic and pleasing visuals. Tropezia Palace has been an instant online casino since it was launched. It uses the Flash technology, which means that it can be accessed directly from any web browser without having to download and install any software on your hard disk. While this website initially offered the games from the developer Betsoft, it has gradually expanded the game selection to accommodate games created by multiple developers, such as Microgaming, MGA, iSoftbet, Quickspin, Play'n GO, 2By2 Gaming, Leander Games, Playson, Big Time Gaming, Cryptologic, ELK Studios, Lightning Box, Netent, NextGen Gaming, Rival, Thunderkick, Ainsworth, Casino Technology, Felt Games, Blueprint Gaming, Yggdrasil, Noble Gaming, Felix Gaming, EGT and Red Rake. This allows them to offer one of the most attractive game selections of currently over 1,500 casino games. You can enjoy over 1,200 different slot machines. Among them, you will find many slots with impressive 3D graphics, such as Good Girl, Bad Girl and After Night Falls, as well as many games inspired by cult works, including the comic Judge Dredd. To help you find your way around this huge selection, the online casino offers you the option to sort the games by developer or name. You also have the option to save your favourite games, which you can then easily find on the homepage. There is a small downside of the slot games though: there are not that many progressive jackpots available, only a few games give you the chance to win a progressive jackpot, and the jackpots are not very high either. In this last section you will find table games, such as baccarat, craps or red dog, as well as bingo or scratch cards. There is also an excellent 3D virtual horse racing game. Unfortunately, the online casino does not offer live games with live dealers. On the plus side though, the casino is optimised for mobile play and supported on many mobile devices. The entire game selection is excellent and very diverse, offering enough choice to please the vast majority of players. 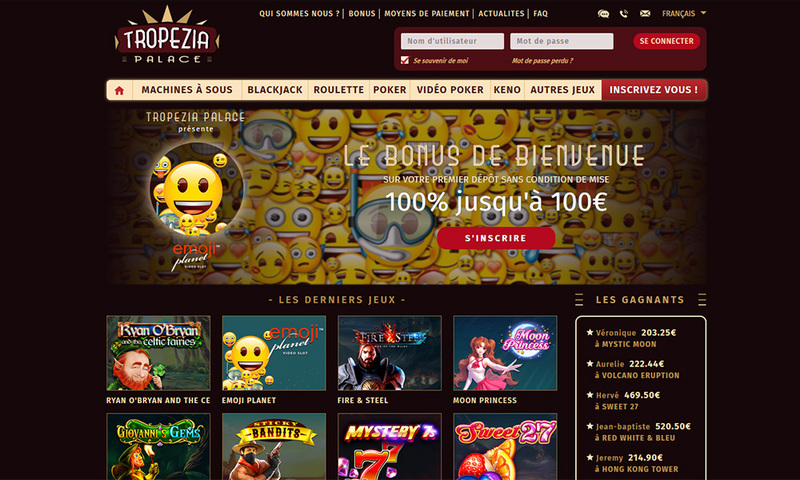 When it comes to promotions, Tropezia Palace is not necessarily the most generous online casino of the industry. Nevertheless, it makes up for it with their bonus terms that are very flexible. You will be welcomed with a 100% welcome bonus up to 100€/$/£ on your first deposit into your player account. Even though this offer may at first seem a bit limited, but you should know that the casino offers great wagering requirement conditions of 20 times deposit plus bonus. After these have been fulfilled you can withdraw the money you win whenever you want. This offer is available for some countries. For some other countries it is possible to even get the bonus money without wagering requirements. This welcome bonus is certainly a very attractive offer. a Gentlemen's Night bonus of 40% up to 100€/$/£ for men every Tuesday evening. Tropezia Palace also has a VIP club that offers a royal service and attractive benefits. You can enjoy gifts, exclusive offers, personalised service and faster processing times for all of your transactions. Using a license from the government of the Netherlands Antilles (Curaçao), Tropezia Palace is known for their professionalism. It also uses a 128-bit compatible SSL Version 3 encryption, which makes it 100% safe and secure. The customer service is available by email and live chat. A positive point: the support is also available when you are playing a game. You can find the "Help" tab on the right-hand side of all pages, which allows you to ask questions without having to close your game. You can contact them during business hours, daily from 10am to 10pm. The opening times are one of the few limitations of the customer support, as it is not open 24/7. However, the operators are always friendly, professional and efficient with their response. The support is also available in multiple languages. Even though it is not possible to call the support directly, you can ask the support team to give you a call back. You can also find this option in the "Help" tab. The minimum deposit is 10 €/$/£ and the minimum withdrawal is 100 €/$/£. You should also know that there is no maximum limit when withdrawing progressive jackpots. However, for other winnings above 9,500 €/£/$ you must be a VIP for the right to withdraw more than this amount in one month. In conclusion, we can say that despite some small flaws here and there, such as the limited number of progressive jackpots, and a customer support that is only available from 10am to 10pm, it is clear that Tropezia Palace has multiple advantages. Especially the great bonus terms and the impressive range of games stand out. In short, it is one of the best online casinos on the market. Try it out as soon as possible! Been playing at Tropezia Palace for quite some time now, but also read a lot of negative reviews about them. Personally, I've never had a problem with them, and they always paid my winnings. I really like the design of the site and the games are good too. I prefer playing the slot machines, but sometimes i play blackjack too. i've never noticed anything dodgy with the site at all. what i miss though is a live casino, which was previously pointed out too. maybe they have that in the future, would be a good addition. I love Tropezia Palace and how professional the site is. I have been playing there for a while and whenever I won money they always processed my withdrawals very fast. The support is also very professional and always helps to resolve issues as quickly as possible. I can only recommend this casino! Tropezia Palace is a great website, and I have been playing there for years now. They have some of my favourite slot games from netent, microgaming and betsoft, but also many more. i really like the website and using it is simple. they also have great bonuses. personally, i have never had a problem with the payouts, they always paid me, but sometimes it takes a little long. but as long as i get my money i don't really mind. they are usually quite fast. the customer support is also very helpful and friendly, i cannot complain about them at all. I've been playing at Tropezia Palace for a while now, and I can say that this is a great website with a very nice customer support. They always anserwed my questions politely and professionally, and never refused to pay out my winnings either. The games are great and I never had any problems playing them. Sometimes when my internet connection dropped, I could resume where I left of and didn't I didn't lose any money over a reset connection. the selection is great though, and you can find the awesome Betsoft and Netent slots. What I also like about the casino is the design and the navigation through the many games. I give it four stars because they don't have a live casino yet.